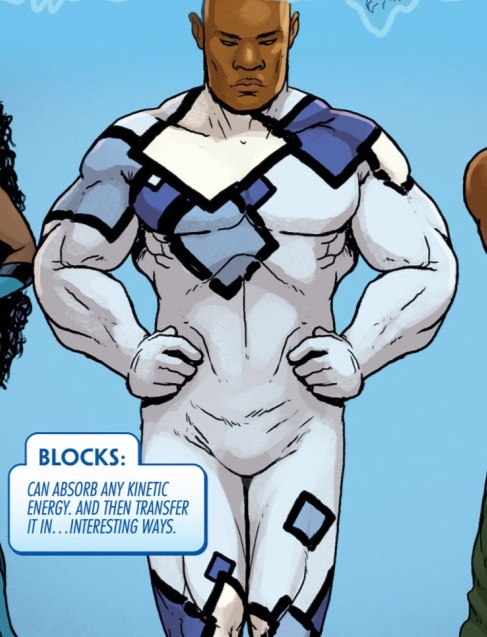 Powers: He has the ability to absorb any kinetic energy and then transfer it in…interesting ways. Blocks is a member of the proud people of Wakanda. He has unspecified kinetic energy absorption and transferal abilities. Under the reigning queen Shuri of Wakanda she joined the Wakandan School for Alternate Studies after the events of Doomwar and AVX. This is what I’m talking about, with all the great black creators and HEROS out there a couple of white guys are the ones who basically have the autonomy to create black characters for Wakanda and then give them plain and simple names like Bull and Block. And on top of that,they already can’t stand each other and their from the most advanced and I would imagine the most civil country on earth! Nah, I ain’t wit it. and what are these interesting ways to re-transfer the energy he absorb ?